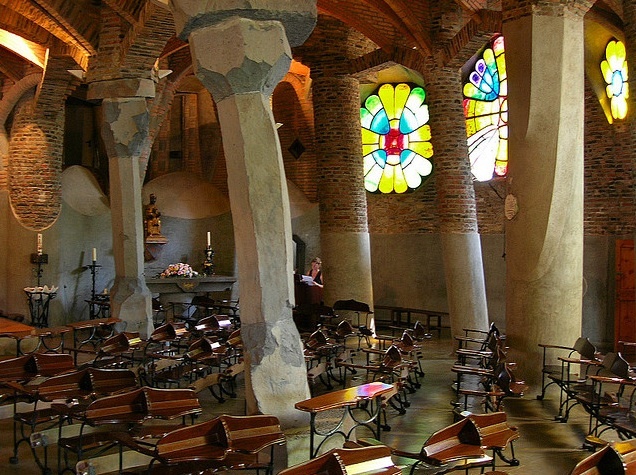 Located in the industrial suburbs just southwest of Barcelona proper, this is really a half-day excursion, easy to reach thanks to the frequent FGC commuter trains from Plaça de Espanya (lines S4, S8 and S33 all stop at the Colònia Güell station). The trip takes about 20min: see website for the Combinat Güell offer that offers return tickets, admission and audio guide. At the end of the 19th century, tycoons everywhere were building planned industrial communities out beyond the suburbs, looking for more room to grow, but more importantly, hoping to avoid the constant labour disputes and class violence of the cities. In Barcelona, Eusebi Güell began his own little adventure in planned rural paternalism in 1890, located in what was then open country at Santa Coloma de Cervelló. Güell shut down his Barcelona cotton mills, fired all his Anarchist employees, and headed out for the promised land. The Colonia was planned as a pseudo-worker’s-cooperative (Güell was still very much the boss), with a wholesome atmosphere, and plenty of opportunities for education and moral uplift for the employees. The cotton mill still stands on the edge of the village. At the start of the Civil War, Güell's shockingly ungrateful workers immediately took it over and turned it into a collective. It finally closed in the 1970s, and it's being restored now for industrial uses. The little village around the factory is a quiet, down-at-heel, rather dreamlike place today, built around a small square with a statue of the patriarch, Eusebi Güell. Houses, shops and other buildings for the workers were designed by Gaudí’s assistants, Francesc Berenguer and Joan Rubió Bellver. The Ateneu, a combination school and cultural centre, gives some hint of the idealism behind the project. The real reason for coming here, though, is the church, known as the Cripta Gaudí and the architect's great unfinished masterpiece. All the architect's models and plans were destroyed at the beginning of the Civil War, but the sketches that survive look like a cross between Coney Island and the Emerald City of Oz—the prototype for the Sagrada Familia. Unfortunately, with a postwar recession and Eusebi Güell's death in 1918, funds for the church dried up and only the crypt was completed. Yet of all Gaudí’s works, this magical, primordial avant-garde grotto is the most innovative – a marvel of virtuosity and engineering. It has no right angles, no straight lines – the pillars bend at weird expressionist angles. If you’ve been to the museum of the Sagrada Família, you’ve seen the copy of Gaudí’s complex system of catenary arches: dangling webs of chains and weights that he photographed and turned upside-down to help work out problems of stress and loads that were nearly impossible to calculate mathematically. Modern architects can duplicate this with the aid of sophisticated computers. Gaudí had only the thunder and lightning of his brainstorms, and something else modern architects lack—Catalan bricklayers, the same gentlemen whose incredible factory chimneys in Terrassa and Poble Nou are now preserved as works of art. There is no steel reinforcing anywhere in this building: the whole thing is made of rough hewn stone and brick, primitive textures brightened here and there with stained glass and small trencadi collages. Also, interestingly enough, there is very little consciously religious art or symbolism in the building, as if Gaudí was trying to express spirituality in architecture alone. Hours Nov-Apr: Mon-Fri 10am-5pm, Sat & Sun 10am-3pm. May-Oct: Mon-Fri 10am-7pm, Sat & Sun 10am-3pm. Located off the BV2002, at Santa Coloma. Information about the Colonia Güell, tickets for the church, and guided tours are available from the Centre Acollida de Visitants on C/ Claudi Güell. Adm €7; students and over 65s €5.50.